Unless noted, all student recitals are held in Cypress Recital Hall. All student recitals are free and open to the public. The A.S. Ticket Office is located directly across from Subway in the University Student Union (USU). The A.S. Ticket Office offers ticketing services for nearly all campus events, from athletics and comedy to theater, music and more. Discounted tickets to local movie theaters and theme parks are also available. Stop by the A.S. Ticket Office, or call (818) 677-2488 for more information. 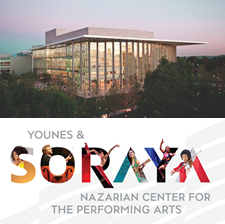 To purchase tickets to Music Department events at The Soraya, please call 818-677-3000. The Soraya Ticket Office is open Tuesday-Sunday, 11am-4pm.